A group of Native Americans has threatened to take physical action to stop the construction of three oil pipelines, claiming that the transport systems would take over their land and infringe upon their rights. Leaders from ten Canadian and US indigenous groups gathered in Ottawa, Ontario on Wednesday to protest the construction of pipelines which would move tar sands oil from Canada to the US. These pipelines would run across the traditional land that is sacred to these Native Americans. “Tar sands pipelines will not pass through (our) collective territories under any conditions or circumstances,” the tribes relayed at a press conference. 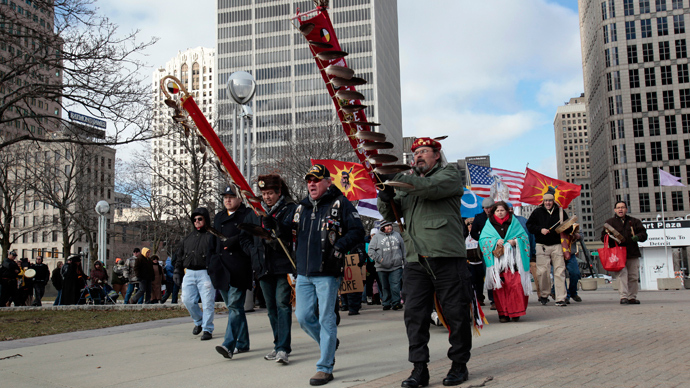 Phil Lane Jr., a hereditary chief from the Ihanktonwan Dakota Oyate in the state of South Dakota, said that indigenous groups from all across the US and Canada are coming together to protest the building of the pipelines that would destroy their sacred lands – and that they will physically stand in the way of their construction. "Along with every single legal thing that can be done, there is direct action going on now to plan how to physically stop the pipelines," he said at the news conference following the gathering in Ottawa. Canada has been financially struggling to cope with falling revenues as a result of pipeline bottlenecks. Oil and gas exports account for eight percent of Canadian GDP, and the new pipelines could boost the country’s economy and diversify exports. The Canadian Energy Research Institute in January estimated that if oil and gas producers fail to get access to new markets, the economic losses could total $1 trillion over 20 years. But while the Canadian government might benefit financially from the proposed pipelines, it would inevitably affect the environment. During their gathering, the Native Americans emphasized the fact that the pipelines would boost carbon-intensive oil sands production, which would ultimately expedite the effects of climate change. Aside from the detrimental affects to the climate and the infringement upon indigenous lands, the aboriginal groups believe that the US and Canadian governments should consider their rough history and avoid taking more land from them. "They've been stealing from us for the last 200 years … now they're going to destroy our land? We're not going to let that happen," said Martin Louie of the Nadleh Whut'en First Nation in British Columbia. Louie said that his people will do everything they can to stop the construction of the pipelines, whether its going to court or putting their lives at risk by blocking the machines from placing materials on their grounds. Enbridge Inc., the company responsible for the proposed construction of the Northern Gateway, told Reuters that it has made agreements with 60 percent of the aboriginal communities about the proposed route and has promised those communities equity stakes. But the remaining 40 percent refuse to take money from the pipelines’ construction and are fighting to stop the project that is estimated to be completed in 2015.